At this point, it’s obvious that many have missed something noteworthy from Wizkid’s runway debut for Dolce & Gabbana on Saturday, the Italian duo who showcased their menswear show in Milan for their spring/summer 2019 collection. 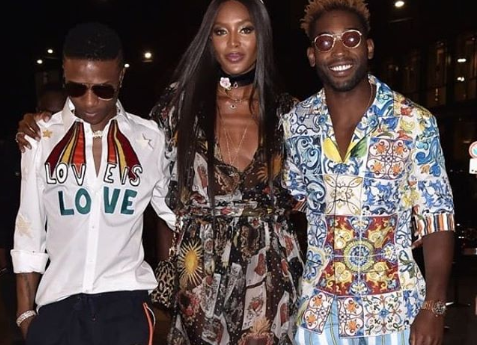 In a photo with supermodel Naomi Campbell and English rapper Tinie Tempah, Wizkid wore a white shirt with the #LoveIsLove slogan emblazoned across the front, a powerful nod towards the LGBTQ gospel of awareness and acceptance. Do you think that #Wizkid knows that he’s preaching the gospel of the #LGBT with that top he’s wearing? There are many ways to look at this rather surprising posturing, but what I won’t ponder about is Wizkid’s sexuality. Nah. That’s entirely his business. Given Stefano Gabbana’s homophobic comments in the past, and making it fashion, Wizkid’s free-floating, LGBTQ-centric shirt manages to temporarily scrub out all that wrongdoing. After all, inserting a huge bankable star like Wizkid in Dolce & Gabbana’s men’s catwalk is to court fashionable millennials and introduce their palate to the brand’s latest offerings. Another thing is this: did Wizkid, at any point, realise what he was wearing? The month of June is Pride Month, that time of the year where LGBTQ people in some parts of the world celebrate the community and the freedom to be themselves. Was Wizkid conscious of this enough to appeal to global queer fans? This coincidence can’t just be ignored. Well, I guess we will know in the future if this is genuine advocacy or just woke pandering.